Once the Brexit negotiations are complete and the terms of Britain's exit from the EU have been agreed, do you think there should or should not be a referendum to accept or reject them? This statistic shows the result of a survey of British adults regarding their support for a second EU referendum once the terms of Brexit are agreed, from January to July 2018. 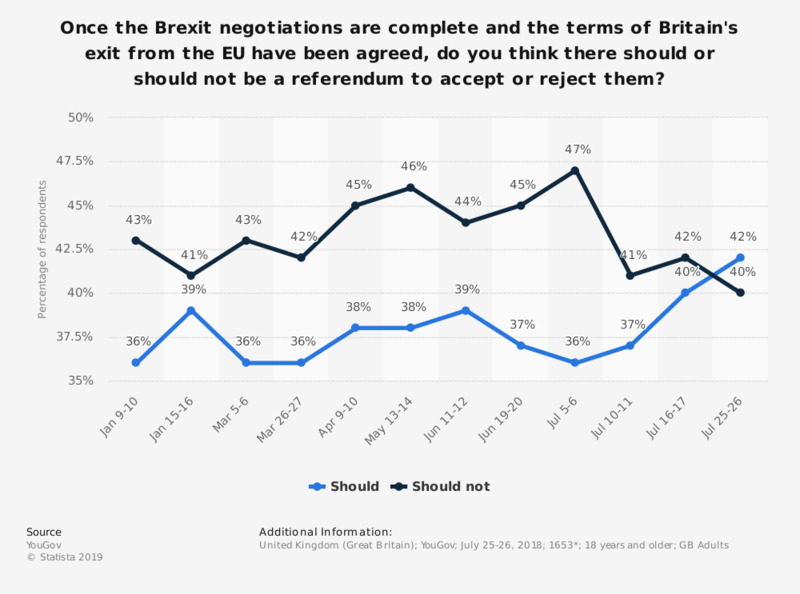 Between January 9 and July 17, most people opposed having a second referendum, although in the latest survey, more people support holding a second referendum. Statistics on "EU membership referendum in the United Kingdom (UK)"
How do you intend to vote in response to the question: should the United Kingdom exit the EU? Based upon the information you know today, how would you vote? If you were eligible at the time, how did you vote in the UK European Economic Community membership referendum in 1975? When the referendum is held on 23rd June 2016, will you vote? United Kingdom: Which of the following best describes how you feel about the EU debate at this time? Public opinion: Is it the right time to hold a referendum on the EU? How well informed do you feel about the forthcoming referendum on the UK's membership of the EU? United Kingdom: What is the UK’s membership of the EU beneficial for? Do you think it would have a good or bad effect on British jobs if we left the European Union, or would it make no difference? Do you think it would have a good or bad effect on the NHS if the UK left the European Union? Do you think your household will be better or worse off financially if Britain leaves the European Union? Would there be a good or a bad effect on people’s pensions if the UK left the European Union? Do you think Britain would be more or less at risk from terrorism if we left the European Union, or would it make no difference? Do you think Britain would have more or less influence in the world if we left the European Union, or would it make no difference? Would you personally be better or worse off if the UK left the European Union? In what form would you like the UK to leave the EU? In what form would you like the UK to remain a member of the EU? United Kingdom: to what extent do you agree or disagree with Britain’s membership of the EU being beneficial for the nation? United Kingdom: to what extent do you agree or disagree with Britain’s membership of the EU being beneficial for your business? In the three years after an exit, how would Brexit affect your country's employment levels? Small business: based upon the information you know today, how would you vote in the EU referendum? If there was a referendum on the UK's continued membership of the EU tomorrow, what result would be the best for your business? In the three years after an exit, how would Brexit affect your industry's revenue? In the three years after an exit, how would Brexit affect your industry's investment levels? In the three years after an exit, how would Brexit affect your industry's employment levels? In the three years after an exit, how would Brexit affect your company's revenue? In the three years after an exit, how would Brexit affect your company's investment levels? In the three years after an exit, how would Brexit affect your company's employment levels? What impact would the withdrawal from the EU have on your business? What impact would remaining in EU have on your business? What impact would withdrawal from the EU have on your business? What impact would the UK remaining in the EU have on your business? What impact would the UK withdrawal from the EU have on your business? Now that the result has been announced, do you regret voting leave in the EU referendum? How do you think the UK leaving the EU will affect the amount of tax you pay over the next five years? Now that the result has been announced, do you regret voting remain in the EU referendum? Thinking about the result of the EU referendum, which of the following best reflects your view? How do you think the UK leaving the EU will affect your pension over the next five years?